2019 marks the 15th anniversary of the Gretsch Custom Shop, where time-honored legacy reaches its creative apex. 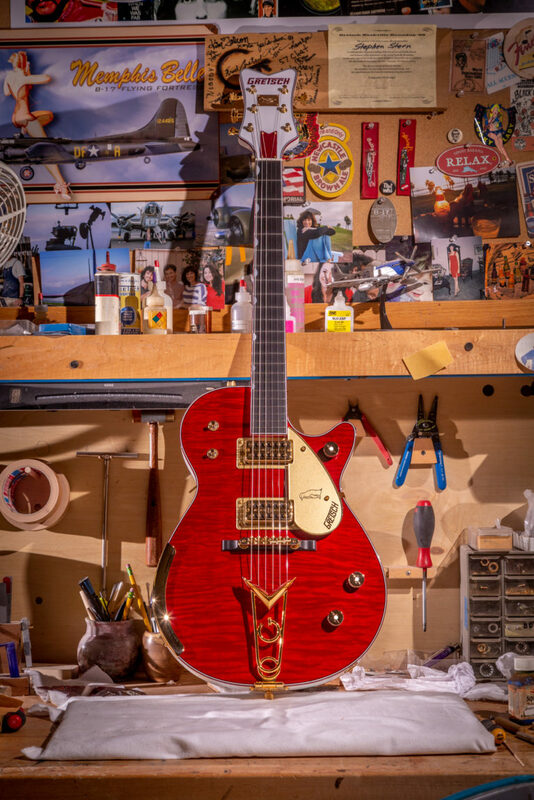 From modern versions of legendary Gretsch® instruments to artist tribute models and specially requested one-off guitars, the Gretsch Custom Shop takes “That Great Gretsch Sound!™” to an entirely new plane. To commemorate the anniversary, the Custom Shop is proud to announce the Gretsch G6134-GCS15 Custom Shop 15th Anniversary ’59 Penguin™ NOS model. Since ruby is the precious stone that designates a 15-year milestone, this Penguin features a mahogany body with curly maple top dressed in a magnificent Trans Ruby Red finish with white back, sides and headstock, all tied together with ruby red sparkle body and neck binding. Ray Butts Full Fidelity pickups power this radiant instrument with plenty of sparkly notes and dynamic tones, tighter bass and a touch more top end. Limited to an exclusive 15-model run, the G6134 Custom ’59 Penguin also features an ebony fingerboard with 22 vintage-style frets and pearloid Neo-Classic™ thumbnail inlays, Gretsch Custom Shop 15th Anniversary headstock plate, Adjusto-Matic™ bridge with pinned ebony base, classic Penguin-adorned gold pickguard and shimmering gold hardware including the banjo armrest, “G” jeweled knobs, Grover® Imperial tuners and Gretsch Cadillac tailpiece.